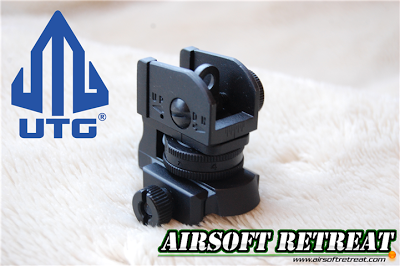 UTG has been one of the main manufacturers of low priced, high quality real steel and airsoft accessories for the last 20 years, and their iron sights are great options both for real firearms and airsoft replicas. The sight being reviewed today is a compact, lightweight rear unit, designed for M4/16 models. I will discuss the pros and cons of this rear sight in this review, so keep reading for more information! I was sent this sight directly by UTG in order to have it reviewed here on Airsoft Retreat. It is available at websites such as Cheaper Than Dirt, priced at about $25. This price puts it on par, if not cheaper than most replica iron sights, which is impressive considering this thing is designed for real steel use. Like all UTG products, it includes a warranty against manufacturer defects. The sight comes packaged in a small vacuum formed plastic package with a piece of cardboard backing it. The packaging is retail ready, complete with a loop to hang it on a store's rack. My first impression upon getting the sight in my hands was surprise with how small it really is. I'm used to normal chopped rear iron sights, but this thing is only about half the length of one of those models. This iron sight is a full metal, compact unit, which is designed for use on M4/16 flat top variants. Constructed of steel and aluminum, it is incredibly sturdy and durable, but only weighing in at 3.4 oz. Its form and function is very similar to a standard M4/16 rear sight, but its smaller form and footprint make it easier to mount alongside optics or other accessories. It is fully adjustable for windage and elevation without needing tools, and it is secured to your gun using a QD thumbscrew. 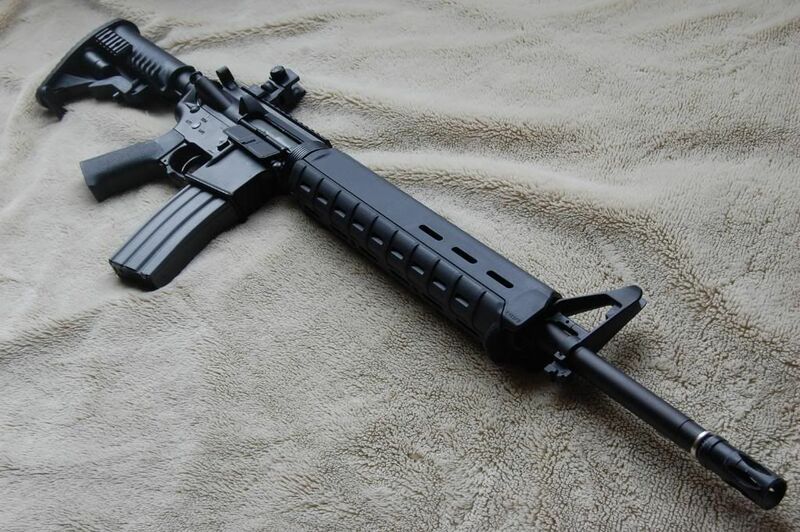 The windage and elevation adjustment points are located right where they normally are on an M4, however, the elevation adjustment dial is easier to access, due to the removal of the rear support piece. They are a bit stiff at first, but they do adjust well with clicks at each selected position. The mounting deck has a crossbolt to keep it centered in a groove on the rail of your gun, and the thumbscrew is smaller than the normal one on standard carry handle rear sights. The mounting clamp is spring retained, and the thumb screw has a flat head notch to let you really tighten it down onto your gun. The aperture is adjustable for short and long ranges, just like a normal M4/16 rear sight. It clicks securely between the two settings, so you don't need to worry about the aperture piece flopping around while moving. The aperture holes themselves are very crisp with no visible casting defects to mess up your sight picture. At the rear of the sight body, you'll find markings to indicate how centered the aperture is inside the body, which helps you with zeroing in the sight to your shooting style and gun performance. These features all add up to make the sight very easy to use. When mounted on your gun, it will be slightly more forward than most iron sights, due to the location of the crossbolt. This prevents it from being mounted all the way back on an M4 top rail, however, it doesn't negatively affect the performance of the sight. Once you have it mounted, you can see that you still have a ton of room for other optics and accessories on your top rail, as the thing only takes up about 4 rail slots. Quality wise, the whole thing fits together VERY well, with almost zero slop or freeplay in the aperture unit/main body connection point. It has slight amounts of grease applied to keep everything moving smoothly when adjusting it, and it is adjustable over a wide range of settings. I needed a compact rear iron sight for a project buildup, and the UTG lightweight rear iron sight fit the bill perfectly. It has a small footprint, similar to a Larue fixed rear sight, but at a fraction of the price. It gives your gun a unique look, and allows you to run a variety of optics on your top rail at the same time. It can be attached or removed in seconds, thanks to the QD thumb screw, and it is adjustable without the need for tools. I can't see myself using a standard chopped rear sight again after getting my hands on this thing, and its low price makes it accessible to almost anyone!